The suggested Bible reading for today [6 March 2017] is: John 2: 1-12. 1 Καὶ τῇ ἡμέρᾳ τῇ τρίτῃ γάμος ἐγένετο ἐν Κανὰ τῆς Γαλιλαίας, καὶ ἦν ἡ μήτηρ τοῦ Ἰησοῦ ἐκεῖ: 2 ἐκλήθη δὲ καὶ ὁ Ἰησοῦς καὶ οἱ μαθηταὶ αὐτοῦ εἰς τὸν γάμον. 3καὶ ὑστερήσαντος οἴνου λέγει ἡ μήτηρ τοῦ Ἰησοῦ πρὸς αὐτόν, Οἶνον οὐκ ἔχουσιν. 4 [καὶ] λέγει αὐτῇ ὁ Ἰησοῦς, Τί ἐμοὶ καὶ σοί, γύναι; οὔπω ἥκει ἡ ὥρα μου. 5 λέγει ἡ μήτηρ αὐτοῦ τοῖς διακόνοις, Ο τι ἂν λέγῃ ὑμῖν ποιήσατε. 6 ἦσαν δὲ ἐκεῖ λίθιναι ὑδρίαι ἓξ κατὰ τὸν καθαρισμὸν τῶν Ἰουδαίων κείμεναι, χωροῦσαι ἀνὰ μετρητὰς δύο ἢ τρεῖς. 7 λέγει αὐτοῖς ὁ Ἰησοῦς, Γεμίσατε τὰς ὑδρίας ὕδατος. καὶ ἐγέμισαν αὐτὰς ἕως ἄνω. 8 καὶ λέγει αὐτοῖς, Ἀντλήσατε νῦν καὶ φέρετε τῷ ἀρχιτρικλίνῳ: οἱ δὲ ἤνεγκαν. 9 ὡς δὲ ἐγεύσατο ὁ ἀρχιτρίκλινος τὸ ὕδωρ οἶνον γεγενημένον, καὶ οὐκ ᾔδει πόθεν ἐστίν, οἱ δὲ διάκονοι ᾔδεισαν οἱ ἠντληκότες τὸ ὕδωρ, φωνεῖ τὸν νυμφίον ὁ ἀρχιτρίκλινος 10 καὶ λέγει αὐτῷ, Πᾶς ἄνθρωπος πρῶτον τὸν καλὸν οἶνον τίθησιν, καὶ ὅταν μεθυσθῶσιν τὸν ἐλάσσω: σὺ τετήρηκας τὸν καλὸν οἶνον ἕως ἄρτι. 11 Ταύτην ἐποίησεν ἀρχὴν τῶν σημείων ὁ Ἰησοῦς ἐν Κανὰ τῆς Γαλιλαίας καὶ ἐφανέρωσεν τὴν δόξαν αὐτοῦ, καὶ ἐπίστευσαν εἰς αὐτὸν οἱ μαθηταὶ αὐτοῦ. 12 Μετὰ τοῦτο κατέβη εἰς Καφαρναοὺμ αὐτὸς καὶ ἡ μήτηρ αὐτοῦ καὶ οἱ ἀδελφοὶ [αὐτοῦ] καὶ οἱ μαθηταὶ αὐτοῦ, καὶ ἐκεῖ ἔμειναν οὐ πολλὰς ἡμέρας. In the opening chapter of Saint John’s Gospel, we are introduced to a new creation, a new creation that is in Christ. After his Prologue, Saint John introduces the first six days in this new creation, and in today’s reading we have come to Day Seven. What did God do on the Seventh Day in the account of creation in the Book Genesis? God rested. And now that we have arrived at Day Seven in the opening week of Saint John’s Gospel, we come to the Day that Christ rests with his disciples, and to a foretaste of the Heavenly Banquet, which is the completion of God’s creation. ‘Blessed are those who are invited to the marriage supper of the Lamb’ (Revelation 19: 9). Seven has a symbolic meaning or significance in this Gospel. This is the first of the seven miraculous signs by which Saint John attests to Christ’s divine status. This Gospel is structured around these signs, and the word used by Saint John is unique. He uses the Greek word σημεῖον (semeion, ‘sign’ or ἔργον meaning ‘work’), instead of the term the Synoptic writers normally use for miracle, δύναμις (dynamis, meaning act of power). Already in this Gospel, Christ has promised his new disciples that he would show them his glory … in this reading we see that promise fulfilled in the first sign, at the wedding in Cana. The image of the Lamb of God in this Gospel is like a triptych, with the two Johns – John the Baptist at the beginning of the Gospel, and John the Beloved Disciple at the end – as witnesses to who the Lamb of God is. In a similar way, Galilee acts as a geographical enclosure for Christ’s disclosure: Galilee is the first place to behold Christ’s glory, as we see in this story; and Galilee will be the last place to behold his glory, as we will see with the post-Resurrection stories in Chapter 21, and there too we also come across Cana and Nathanael. 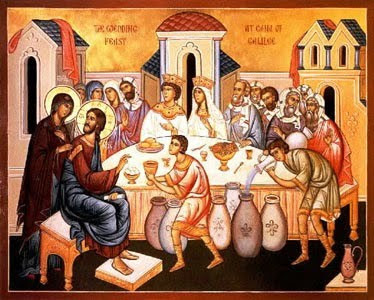 Christ orders the servants to fill the empty containers with water and to draw out some and take it to the chief waiter. After tasting the water that had become wine, and not knowing what Christ has done, he remarks to the bridegroom that he has departed from the custom of serving the best wine first by serving it last (verses 6-10). Saint John then tells us: ‘This was the first miracle of Jesus and it was performed to reveal his glory, and his disciples put their faith in him’ (verse 11). Christ and his new group of disciples have been invited, together. We do not know who the bride and groom were. But at weddings new families are formed. No-one is ever the same again. Brothers become brothers-in-law, sisters become sisters-in-law, mothers become mothers-in-law. New families, new bonds of kinship are created. I wonder who was seated with the groom’s family, and who with the bride’s family. Perhaps they were all related in some distant way. It sounds at first as though Christ is being dismissive, almost as if he is telling his mother to go away and to not bother him. But when Christ calls his mother ‘Woman’ it is not a dismissive or derogatory term, but a term of great respect, as it is again at the Crucifixion, when he says: ‘Woman, here is your son’ (see 19: 26). Jesus says … and they do. Why do you think the servants obeyed Mary and then obeyed Christ? And why was the steward not in control of what was going on at this stage? Was he hiding in embarrassment? Had he headed off to buy some more wine? Had that been a failed venture, like the disciple failed to come back with food when they were sent to Sychar? See John 4: 1-42, which is the passage recommended for next Saturday (11 March 2017) and next Monday (13 March 2017)? Notice the role of similar people in other Gospel stories. Here and in the parable of the wedding banquet (Matthew 22: 2-14), the attendants have the role of διάκονος (diakonos, deacon), a waiter, one who executes the commands of another, especially of the master or the architriklinos. The word for the unjust steward (Luke 16: 1-8) is οἰκονόμος (oikonomos), the manager of a household or of household affairs who was free-born or a freed-man who was delegated oversight. We can see here the parallels with the ministry of bishop and priest and of deacon later in the New Testament. Who does the steward at Cana have parallels with? See how the steward shifts responsibility to the bridegroom. But the truth is that the good wine has been kept until now. Now the best of God’s promises are about to be fulfilled. The miracles were not wonders to astound but were signs pointing to Christ’s glory and God’s presence in him. This is the first of the signs. For the second sign see 4: 46-54. When the wedding is over, Christ heads back to Capernaum, which was on the northern shores of the Sea of Galilee. He goes there with his mother, his brothers, and his disciples. New relationships have been formed. Some of them go back as new brothers-in-law, perhaps one of the them was a new father-in-law. Christ calls us into new relationships, with him, with God the Father, and with one another. And in those new relationships, there are new expectations. Next week (13 March 2017): The Samaritan Woman at the Well (John 4: 5-42). (Revd Canon Professor) Patrick Comerford is Priest-in-Charge, the Rathkeale and Kilnaughtin Group of Parishes. This essay is based on notes prepared for a Bible study in Askeaton Rectory, Co Limerick, on 6 March 2017. I am still finding my way around the Rathkeale and Kilnaughtin Group of parishes, exploring the towns and villages, coming across graveyards and disused churches I have yet to learn the story of, and travelling up side roads and bohereens that end up in farmyards or flooded fields. Two of us were on our way to Newcastle West late f last week when we decided to visit Cahermoyle House, halfway between Rathkeale and Newcastle West, just outside the village of Ardagh. Ardagh has given its name to the Ardagh Chalice and the Ardagh Hoard which were found near here almost 150 years ago in 1868. Rathronan Church was the parish church of the O’Brien family who once lived at Cahermoyle House, and I also wanted to see the house as one of the great works by the architect James Joseph McCarthy (1817-1882), who inherited the mantle of AWN Pugin in the Gothic revival in Ireland. JJ McCarthy was born in Dublin on 6 January 1817, and is said to have been apprenticed at an early age to William Farrell, and may have worked in England for Charles Hansom (1817-1888). From 1846, he started to make a name for himself in Dublin as a Church architect working in the Gothic revival, and in 1849 he was a founder member of the Irish Ecclesiological Society. He became Professor of Ecclesiastical Architecture at All Hallows’ Missionary College, Dublin, Professor of Architecture at the Catholic University of Ireland, and Professor of Architecture in the Royal Hibernian Academy. He supervised Pugin’s Fitzpatrick mortuary chapel in Clough, Co Laois, and when Pugin died in 1852 he took over the completion of many of his unfinished works in Ireland, including his cathedrals in Killarney and Enniscorthy, his church for Anthony Cliffe in Bellevue, Co Wexford, and his work at Saint Patrick’s College, Maynooth. He also took over Richard Pierce’s work on the ‘Twin Churches’ in Wexford after Pierce died in 1854. For much of his career, McCarthy worked from 32 Great Brunswick Street (1846-1855) and 183 Great Brunswick Street (1861-1881). McCarthy died on 6 February 1882 at Charleston House, his home in Rathmines. McCarthy’s monumental works include his cathedrals in Armagh, Cobh, Derry, Ennis, Monaghan and Thurles. His works in the Limerick area include Saint Saviour’s Dominican Church in Baker’s Place, Limerick, and Roman Catholic parish churches in Foynes, Kilmallock, Newcastle West and Rathkeale. But Croom House and Cahermoyle House are probably his only two private houses in Co Limerick. Cahermoyle House was designed in what has been described as the ‘North Italian style’ for Edward W. O’Brien, son and heir of the patriot and politician William Smith O’Brien (1803-1864). Cahermoyle means ‘the stone fort of the soft ground.’ About one-third of the circular stone wall of the Caher, probably dating back 2,000 years, still survives 100 metres west of the house. Cahermoyle became the property of the Norman FitzGeralds shortly after the arrival of the Anglo-Normans at the end of the 12th century. After the Desmond rebellion and forfeitures in 1583, Cahermoyle escaped because it was part of the dowry of the rebel earl’s daughter, Lady Catherine FitzGerald, who had married Sir Daniel O’Brien of Carrigaholt, Co Clare. John Bourke, a wealthy merchant who rented Cahermoyle, was MP for Askeaton in the Parliament of James II. He died there in 1702 and is buried in the Bourke vault in Ardagh. Sir Edward O’Brien, 4th Baronet, of Dromoland Castle, Co Clare, married Charlotte Smith, the heir to Cahermoyle, in 1799, and eventually Cahermoyle was inherited by her younger son, William Smith O’Brien. His elder brother, Sir Lucius O’Brien (1800-1872), would succeed as 13th Lord Inchiquin in 1855, while his sister, Mother Harriet Monsell, was a leading figure in the revival of women’s religious communities in the Anglican tradition. William Smith O’Brien was educated at Harrow and Trinity College Cambridge, and was the Conservative MP for Ennis, Co Clare (1828-1831) and then for Co Limerick (1835-1849). In 1832, he married Lucy Gabbett of High Park, Co Limerick, a daughter of William Gabbett, Tory Mayor of Limerick (1819-1820). But after a radical shift in politics, O’Brien became a leading figure in the Young Ireland revolution in 1848. When he was defeated at the Battle of Ballingarry, Co Tipperary, he was arrested, convicted of treason, and sentenced to be hung, drawn and quartered. However, his was sentence commuted to penal servitude for life, and he was exiled to Tasmania. In the early 1850s, while he was still in exile, his mother’s estate in Co Limerick included lands in the parishes of Clonagh, Kilscannell, Nantinan and Rathkeale in the Barony of Connelloe Lower, Ardagh and Rathronan in the Barony of Shanid, Ardagh and Killeedy in the Barony of Glenquin, Cloncagh in the Barony of Connello Upper, and Effin in the Barony of Coshma. O’Brien was pardoned in 1856, the same year his mother died. After some years in Paris, he returned to Cahermoyle. He had expected to regain the house and lands, which he placed in trust for his wife and their eldest son, Edward O’Brien, before the Battle of Ballingarry. However, Edward did not support his father’s nationalist commitments and William never regained Cahermoyle. He lived there until his wife’s death and then moved to Bangor in Wales where he died in 1864. His body was brought back to Ireland on the mail boat. From the North Wall in Dublin he was brought along the quays to Kingsbridge, by train to Limerick, and to Cahermoyle by hearse drawn by four white horses. On the following day, 12 Church of Ireland and 24 Roman Catholic priests led the cortege to Rathronan cemetery where he was buried. At one point, contemporary reports said, the cortege stretched two miles all the way from Rathronan back to Cahermoyle. In the 1870s, Edward O’Brien’s estate amounted to 4,990 acres. In the early 1871, he commissioned McCarthy to design a new house, replacing the earlier house that had been inherited through his grandmother, the Dowager Lady O’Brien. McCarthy designed Cahermoyle House in the style a Venetian palazzo, with the influences of Venetian, Tuscan, Lombardic Romanesque and Gothic styles, popularised in these islands by John Ruskin. One local historian has written that the house would look more in place by a canal in Venice than in its remote rural setting. The emerging Irish Revival is significantly highlighted in the use of Irish limestone and indigenous craftsmanship. The house combines rusticated and domesticated limestone and sandstone, with carved limestone decorative, features, ballustrades, window frames, quoins and dressed limestone eaves. A strong element of technical skill can be seen in the rough-hewn masonry, and there is a clear decorative emphasis in the structural polycromy. Features such as balustrades, arches and columns are carried from outside to the interior of the house, adding to its grandeur. Cahermoyle House is a detached, four-bay, two-storey former country house, dated 1871, and completed in 1875. It has a square-plan single-bay, single-storey, flat-roofed porch to the east or front elevation. There is a single-bay, three-storey block to the north elevation, with a full-height canted bay window and a single-bay single-storey projecting bay with a cut limestone balustrade to the top of the south elevation. The house has a multiple-bay, two-storey block to the rear or west elevation, with a single-storey projecting arcade having a cut limestone balustrade to the south elevation. The entrance to the house is through the east elevation. Inside, there is a double-height lobby, with a central square with ambulatory to the ground and first floors, divided from the lobby by rendered arcades with column capitals, depicting different scenes, including cows and milkmaids, hunting dogs and boars. The rendered balustrade incorporates marble columns to the first floor. The staircase begins at the west end and is incorporated into a section of the arcade. There are timber panelled doors to the reception rooms. The ceiling in the front reception room has timber battened panels and a carved timber cornice. The ceiling in the library has timber framework with decoratively painted render panels and a stencilled timber cornice. Cahermoyle, home of William Smith O’Brien MP 1803-1864. Leader of the Young Ireland rising 1848. ‘That dear old brown house with its ivied keep haunted by ghosts and grim and dismal tales’. Cahermoyle House was sold by the O’Brien family in 1919, and it was bought in 1922 by the Oblate Order. It became a novitiate, and the Oblates later added an extra 20 rooms to the house, a refectory and community rooms, and a chapel, and they ran a model farm. During my visit to Cahermoyle last week, I was not able to visit the cruciform-plan one-and-half storey chapel adjoining the south elevation. This chapel has a five-bay nave, single-bay chancel, and square-profile single-storey transepts to the east and west elevations. As many as 30 Oblate students were there in the 1950s. However, falling vocations farced the Oblates to sell Cahermoyle and the surrounding lands. The farm was sold in separate lots and Cahermoyle House is now a nursing home. The O’Briens of Cahermoyle worshipped in nearby Rathronan Church, and William Smith O’Brien is buried in the churchyard. A younger son of William Smith O’Brien was the Very Revd Lucius Henry O’Brien (1842-1913), Dean of Saint Mary’s Cathedral, Limerick (1905-1913), who is commemorated in the cathedral in a pair of stained-glass windows by Catherine O’Brien. Dean O’Brien’s sister, Lucy Josephine (O’Brien) Gwynn (1840-1907), was the mother of the Revd Professor Robert Malcolm Gwynn (1877-1962).